One of my favourite Australian online stores (with retail stores in Brisbane too!) is Biome Eco Stores, and I quite often flick over to see what new goodies have arrived. 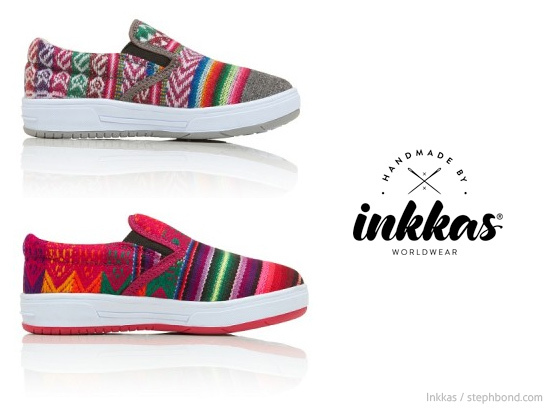 I'm glad I do, as I have fallen hard for Inkkas - fun, fair trade shoes handcrafted by local artisans in Peru using traditional fabric designs and patterns. How great are they! I'm thinking Mother's Day gifts, Father's Day gifts, and look - you can Mini-Me your little one in their own Inkkas shoes! I'm keen on the high-tops to brighten up the Winter days coming soon and will wear them with jeans and dresses with tights. My girls will love the go-with-everything slip-on shoes - easy to throw on and head out the door. You can find Inkkas shoes in Australia in the Biome Eco Store online store and internationally in the Inkka online store.